2016 Battle for the Buoy Champions have been Crowned!! 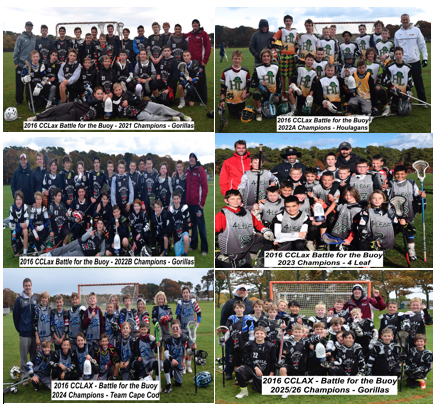 Cape Cod Lacrosse is happy to announce the 2016 Fall Battle for the Buoy Champions. We would also like to thank all of the participants, coaches and spectators in making this 1st annual event a success. We hope everyone had an enjoyable day and that you will all return next year!!!!! which will be held on the weekend of June 24 & 25, 2017. Details coming soon!!! !